These are sorted from my memory of, which buttons I mistakenly press most often. 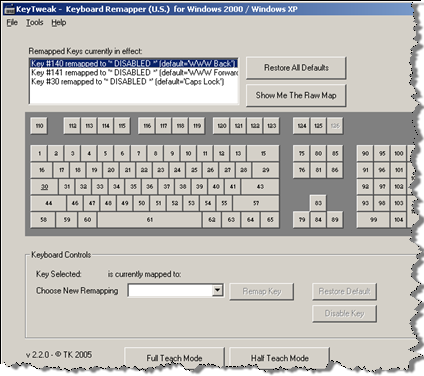 Some of these errors can be solved with a keyboard customization program that is preinstalled with the computer. Screenshot below shows that I was able to adjust sensitivity of F1, back and forward buttons (all of which I use very rarely). I really feared that and my fears turned out to be true. 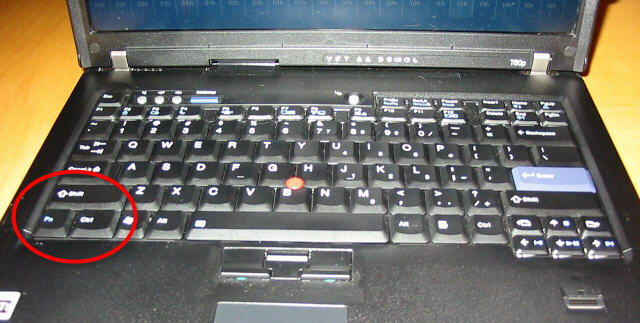 IBM/Lenovo laptops have swapped positioning of the Fn and left CTRL button. This is really annoying. And I’m not the only one saying this. Mostly because I’m used to hitting CTRL a lot. I have a dedicated goal to use keyboard shortcuts as much as possible to increase productivity. But also for another reason. This is simply less productive. 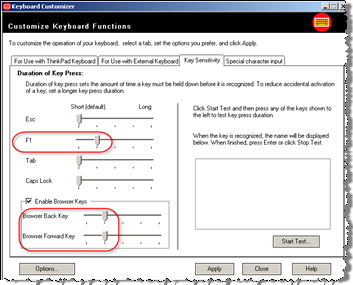 No keyboard shortcuts with the Fn button involves pressing more than one key, but CTRL keyboard shortcuts often involve the Shift key as well. The principle of bringing closely related items together is simply broken here: CTRL and Shift should be close together — as close as possible . 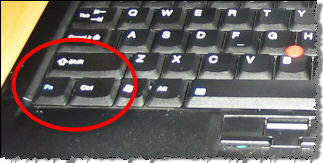 In general, the keys at the edge of the keyboard are the easiest to locate. Therefore, a high productivity keyboard should have keys that are used often at the edge/corners and putting Fn at the lower left is a disaster for keypresses like CTRL + Shift + Arrow keys to select text in word chunks. Try that followed by CTRL + X for cutting the text to clipboard. I just can’t get used to it. If you don’t believe me, try this with your left hand: Pressing Shift with your 4th finger while the little finger presses CTRL so that the little finger is twisted under and to the right of the index finger. Now, with your hand twisted to the left, try hitting T (as I do with CTRL+Shift+T for opening the file menu in my favorite editor). This is barely possible withing the physical limits of ordinary people. Concert Pianists have a vague chance of getting it right, but it’s still a challenge with your and mind eyes focused on getting actual work done. Because of the awkward placement of CTRL, I’m learning to use the right CTRL when pressing PgUp or PgDn — I use that a lot in Firefox. (For some reason, CTRL + Shift + S and CTRL + Shift + P works out OK because its some of the keys where I can use a more natural hand position to hit the keys). 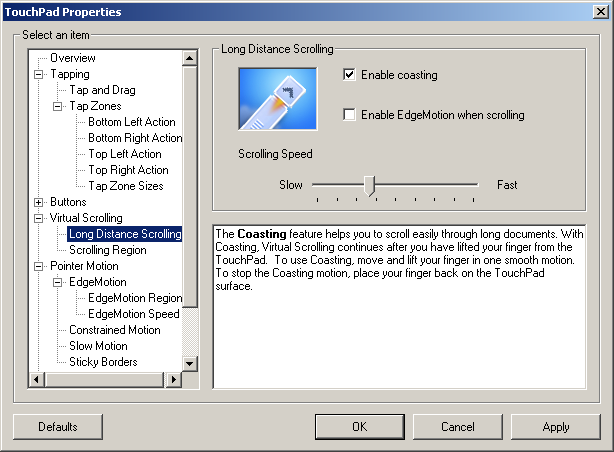 This is a nice one, that I really missed on the old Dell: Scrolling and advanced use of the touchpad. Recently, when Thomas Watson showed me his new Mac, I was impressed with the way to scroll. (Two fingers on the touchpad on a Mac scrolls). This is almost as good: Just move your finger along the right or lower edge of the screen will scroll. I’m really happy with this setting. The best thing about it: It works this way out of the box. Settings are nothing. Having good default settings are everything! Microsoft hotfix to solve it: Hotfix 909095 (“The computer occasionally does not hibernate and you receive an “Insufficient System Resources Exist to Complete the API” error message”). Is this hot? Is this high CPU usage? What if CPU usage goes to 100%? It should really handle the fan control better. So I guess the question is: How do I turn the fan off or lower the CPU frequency in order to silence the fan? My big driver here is off course saving battery. Is there software to swap these buttons around? Putting Fn bottom left and CTRL to the right of it puts my hand in awkward position when I use some of my usual shortcuts. This is simply less productive. No keyboard shortcuts with the Fn button involves pressing more than one key, but CTRL keyboard shortcuts often involve the Shift key as well. The principle of bringing closely related items together is simply broken here: CTRL and Shift should be close together. In general, the keys at the edge of the keyboard are the easiest to locate. 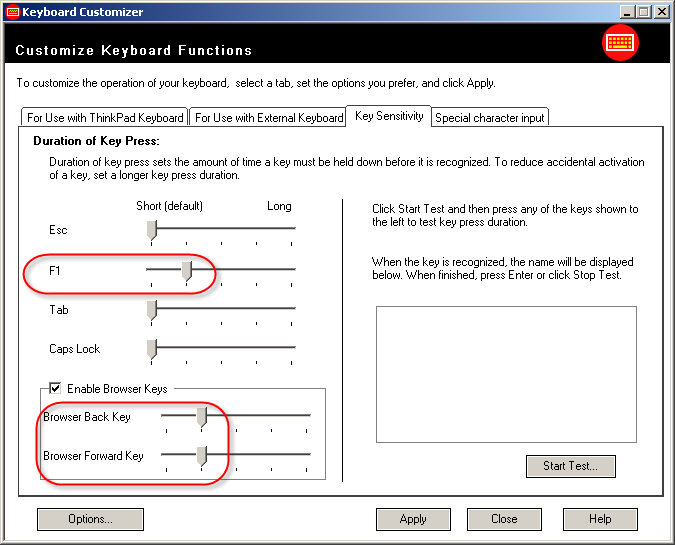 Therefore, a high productivity keyboard should have keys that are used often at the edge/corners and putting Fn at the lower left is a disaster for most keypresses that involve the CTRL and Shift keys. Another funny thing: Occasionally, the wireless network stops working. It’s suddenly not possible to connect even though, sometimes networks are visible. Only cure is to restart computer. In summary, still with these usability issues that affect my productivity or battery consumption, the new laptop is much better configured out of the box than the old one. However, some settings should not be changed, and I urge Lenovo to swap around Fn and CTRL for the next release… If they dare. Update 2007-05-15: I got my first dreaded “blue screen of death” this morning.. Have absolutely no clue what happened. This entry was posted by Jesper Rønn-Jensen	on Thursday, May 17th, 2007 at 00:40 (GMT-1)	and is filed under Hardware, Usability. You can follow any responses to this entry through the RSS 2.0 feed. Both comments and pings are currently closed. Jesper, I got a T60 (not a P model), and I also always hit Fn when I want to hit CTRL – very annoying. And no, I do not have a solution and I do not think they will change it. This has been the standard keyboard setup on IBM computers for a very long time (at least the last 8 years). Another thing; IBM (Lenovo) installs an insane amount of tools – none of them is needed. I formatted the machine, installed Vista and not a single IBM/Lenovo tool. Now my machine works much better (and considerably faster). As for the Fan. Mine is actually somewhat quiet – it only runs occasionally. I am not sure if this is an added problem with your P model (it got a bigger graphic card, thus probably needs more cooling) – or if Vista just handles it better. I also had an extreme amount of Blue-screens when I got my computer – almost to the point where I wanted to trash my computer (I actually did one day, only to pick it out of the trash can an hour later – hey, I got angry after losing 5 hours of work). I think the problem is with some of that IBM/Lenovo junk, because I have not experiences a single blue-screen after reinstalling it. Actually, if you change your Windows layout to ‘Classic’ instead of XP it still has the issue with the 1-pixel space around the Start button. Since most of the functions performed by the Fn-key seems to be independent of the OS (like turning on the keyboard light), I think that it will be difficult to change the configuration. Hehe. When will Lenovo learn and move that Fn button :-) Such a shame when when the laptops are so nice. Did yours also come with a ton of random pre-installed programs – like Picasa, Google Desktop and several others? And also, it works much slower. Before a network power off, discovery of wireless networks is less than a second. Afterwards it’s up to like 10 seconds. Very peculiar. The workaround: Restart computer to be able to use wireless. Ahh. That – I had the same issue. 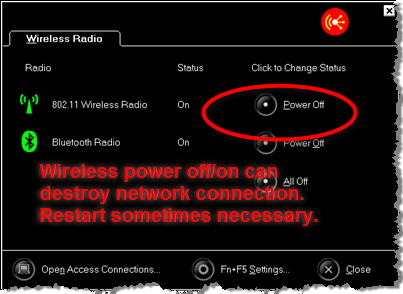 If I turned off wireless anytime during a session and turned it back on it only stayed on for about 5 min and then turned off again. The only work-around was turning WIFI on and shutting the computer completely down before the WIFI turned itself off again. Just do exactly as it says, and it’s pretty harmless, except for a couple of boots. At login after reboot, the machine hangs in an extra dialog “Starting Access Connection” (can’t remember the exact phrase). It’s annoying that it actually delays start and restart of my machine with 30-some seconds. Where do I turn it off? At every startup, there is suddenly two folders in “My Documents”: One called “Access Connections” and another called “Bluetooth Exchange Folder”. I deleted the folders first time I saw them. But they keep coming back. Dear foreign unknown folders: Please stay away from “My Documents”. There is a reason why it’s called “My Documents”: The folder is mine. MINE. Not Lenovo’s! So get out of there you annoying trespassers! Google Talk stopped crashing after uninstalling “Thinkvantage Access Connections”. (and now I don’t have to remove one of the annoying folders in “My documents” that I mentioned in the comment above). That’s what I call a win-win situation. I had some problems with my new Thinkpad T60p as well. I’m a Java developer, and I use Eclipse (www.eclipse.org) a lot. In Eclipse, the shortcut for auto-completing code, is Ctrl+Space. On a thinkpad, the shortcut for re-arranging all the icons on your desktop, and setting screen resolution to 320*200, is FN+Space. The FN, and Ctrl key is right next to each other. Thanks to you, I found out that the process TpScrex.exe, or “Thinkpad FullScreen Magnifier” was the guilty process of rearranging all my icons, and a simple “kill” command was enough, along with an uninstall of that “#%%”#%¤#”%¤#&#”# (insert cursewords here) application. Another thing about that pesky zoom utility, it seems it leaves footprints all over the disk after an uninstall, so I suggest doing a complete search on your C: drive for anything matching the filter “TpScrex”. Then delete everything it finds. Just found “KeyTweak“, that might be for some help here. 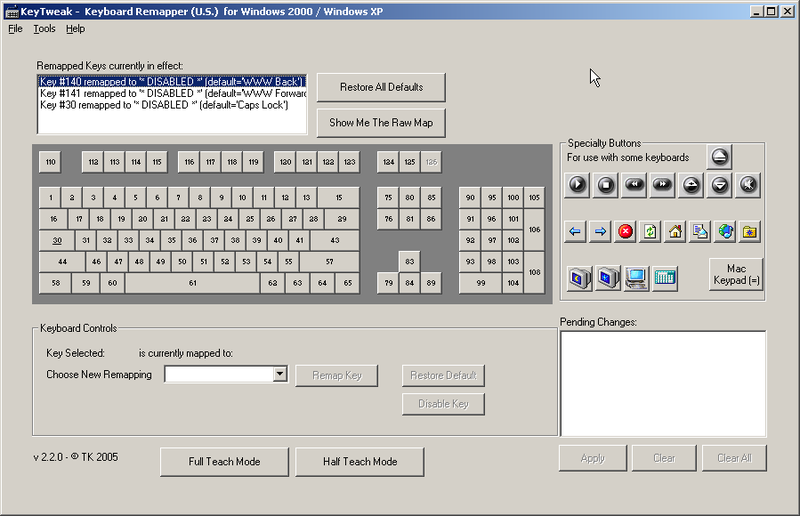 Able to remap your keyboard. Will try this out and give you an update on whether it can help me to unarm the “fn” key. The CPU Fan speed still annoys me: I can see the processors are in the 30 degrees celsius area, but still, the fans just runs away. One of the major problems of the T60 is a thermal issue. 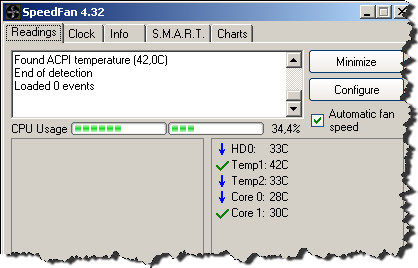 The procesor is quit cool (about 50 degree celsius) and also battery (about 50 degree C) and harddisk (about 40 degree C) are absolutely fine. BUT the powerful graphiccard is a problem. 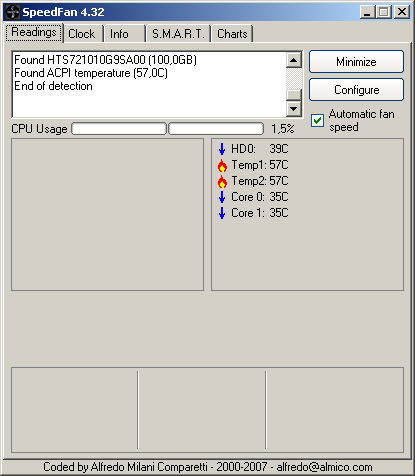 In idle-mode it gets quit hot, round about 75 degree C. Playing some minutes doom3 or UT2004 brings it up to 86-87 degree. Thats still no problem for that card, it get trouble when it get hotter than 110 degrees. BUT your fan of the T60 has to cool the card all the time. also in idle mode. So it’s always running. It is not too loud, but good hearable. And always running parts of a computer are fragile…. 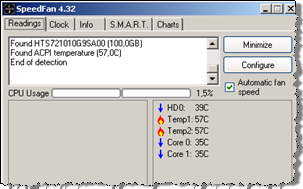 I got some mails from users that with ibm-acpi you can control the fan. That is correct. And with a current version and forcing module-load with experimental=1 you can switch on/off the fan (no more detailed control is possible right now). BUT I do not recommend to switch the fan off, becaus your graphiccard simply needs it, ALL the time ! You risk your hardware when switching it of. Keep that in your mind. One more observation: After uninstalling many of the standard lenovo programs, the machine is running considerably cooler now. Compare these temperatures around the 30’s with the ones up in the article. Approx. 10 degrees lower. I believe that the most important difference is that I uninstalled many of the ThinkVantage programs one by one. Obviously Fn and Ctrl keys can not be swapped by Windows and there is no new BIOS from Lenovo that can do this. Anyone tried the hard way – to open the keyboard and swap the wires below the keys or something like that?